Sankranti marks the beginning of the Sun's journey to the Northern Hemisphere. Curiously, Sankranti is the only Indian festival that follows a solar calendar and not a lunar one. Also the day and night on Sankranti are exactly of equal hours. The festival signals the onset of Uttarayana Punyakalam, an auspicious time in which people worship the sun and take holy dips in the Ganga. How typical of us to invent a simple ritual like bathing to shrug off our sins but the symbolism of the act also shows just how much we rely on Nature. For us, Nature is not just a mother goddess who sates our hunger and thirst, it is also a priestess who with her holy touch, cleanses our spirits. On Sankranti, devotees and believers in quick renewal indulge in a ceremonial cleansing in the Hooghly river, near Calcutta. Thousands head for the Sangam at Prayagraj where the rivers Ganga, Jamuna and Saraswathi flow together. It is also on this day every twelve years that the Great Kumbh Mela is held at Prayag. How significant this day is established by a Mahabharata legend according to which Beeshma Pitamaha lay on a bed of arrows and waited for the dawn of Uttarayana Punyakalam to give up his last breath so that he could depart from a sorrowful life and win freedom from the cycle of birth and death. Sankranti most of all is a time for gratitude. Everywhere in the country, toiling farmers celebrate the onset of harvest with prayers of thankfulness. It is the time when Winter softens its chill and warmth begins to seep back in the air. Like other traditional festivals, Sankranti also focuses on the rituals of cooking and sharing. The staple ingredients in Sankranti treats are til, jaggery and rice. In Bihar and eastern Uttar Pradesh, rice dominates ethnic cuisines on this day. The sharing of til and jaggery laddoos in Maharashtra is symbolic of exchanging good will and spreading happy thoughts. Married women rejoice in Haldi-Kumkum ceremonies. In Karnataka, the same ritual is repeated with just a little modification. Bits of sugarcane, fried til, molasses, pieces of dry coconut, peanuts and fried gram are shared. The gesture combines fruits of a rich harvest and conveys the interconnectivity of human beings with each other and with Nature. The ritual also reaffirms the sweetness of old bonds and the initiation of new ones. The feeling of interconnectivity is also extended to farm animals like cows and bulls who are bathed and ornamented. 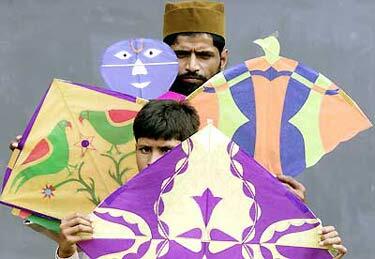 In Gujarat, rainbows of paper kites criss-cross sedate skies in celebration. In Tamil Nadu (where Sankranti is famously known as Pongal) and Andhra Pradesh too, Sankranti is celebrated with detailed rituals and festivities spread over nearly four days. cooking smells, rangoli or kolam patterns outside decorated doors, infuse new life in jaded spirits and remove us from the prosaic minutae of everyday life. In Punjab, Lohri, another interpretation of a harvest festival is a spectacular time when crackling bonfires are built and all regrets of the past year along with offerings of abundance like sweets, sugarcane and rice are thrown into the leaping flames. The morning after is celebrated as Maghi. Village fairs, folk dances and sumptuous meals mark the day. Be it rice surging in boiling milk or soft til-polis or the smell of pure ghee wafting from humming kitchens or the coming together of strangers and relatives and friends and all the elements of Nature, Sankranti is basically about giving back a little of the bounty that Nature bestows on us. 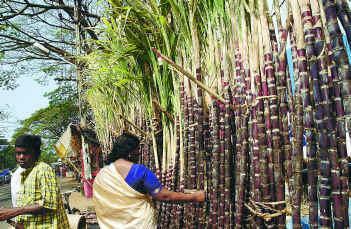 With festivals becoming less about sharing and more about wasteful expense and entire generations growing up without strong roots, Sankranti gives us an opportunity each year to rediscover the innocence of tradition, the symbolism of simple rituals and gratitude that tastes as sweet as sugarcane and teaches us never to take life's gifts for granted.